TUCSON, AZ (Tucson News Now) - If you’ve driven around the city of Tucson in recent years you probably noticed something - the city is growing rapidly. In order to keep up with that growth there’s been quite a bit of road construction and infrastructure development in the Old Pueblo. Now that 2019 has started, that work is set to continue with a handful of new projects. Thanks to the Regional Transportation Authority, three major road construction projects are kicking off this year. The first is the Downtown Links project, slated to have construction begin in fall of this year. It’s an improvement project that’s a four-lane road north of the Union Pacific Railroad tracks that will connect Aviation Parkway to I-10. Downtown Links will also update systems and add railroad crossings, multi-use paths, and bike lanes. The second RTA project is the Broadway widening project. It will widen Broadway Boulevard to six lanes from Euclid to Country Club with bike lanes, sidewalks, and landscaping. Construction is set to start this summer. .With these and other projects on the ledger some Tucsonans are feeling disgruntled, saying they’re annoyed by the construction. Others are praising the construction and saying it’s a necessary key to Tucson’s continued success. Aside from the RTA projects in 2019, there are also a handful of other road projects starting thanks to the passing of Prop 101. Funding for these projects is possible thanks to a half-cent sales tax increase over the next five years. In total that tax increase will create $100 million to fund these projects in the city of Tucson. 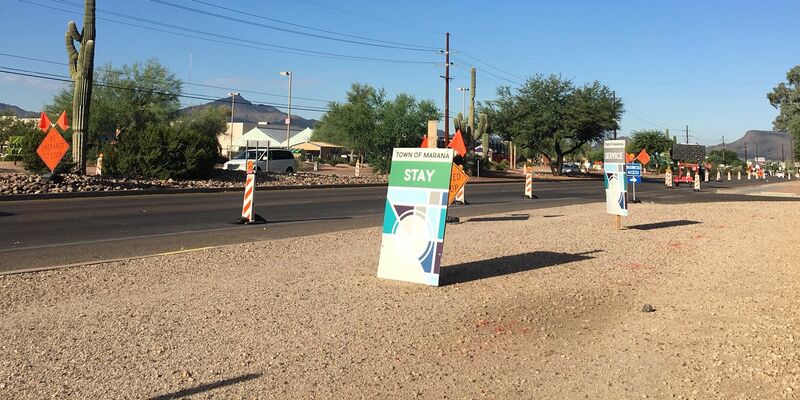 Projects starting this month, funded by Prop 101, include work along Starr Pass Boulevard from Lost Starr Drive to Frontage Road and work along La Cholla Boulevard from Starr Pass Boulevard to Ajo Way. Starting next month, Prop 101 projects along Congress Street from Silverbell Road to Grande Avenue will begin, as well as work along Speedway Boulevard from Painted Hills Road to Greasewood Road. In spring three new Prop 101 projects will begin construction. Those projects are: River Road from Oracle Road to First Avenue, Roger Road from First Avenue to Wilson Avenue, and lastly Runway Drive from Gardner Lane to Prince Road. Finally, in fall, Prop 101 projects along Los Reales Road from Santa Clara Avenue to Nogales Highway, Sixth Avenue from Irvington Road to Illinois Street and Sixth Avenue from Benson Highway to Ajo Way will begin.